The Payment Express Payment Gateway allows you to create a Payment Express payment gateway, providing users to process credit card transactions to pay for their items. In order to use the Payment Express Payment Gateway you will need a Payment Express account at the Payment Express website. The Payment Express online payment gateway and eCommerce solutions cater to a number of banks worldwide, however, may not be available in all regions. Please check the Payment Express website for more information on the availability of this payment gateway. The Payment Express payment gateway accepts all major credit card types including VISA, MasterCard, Amex, Diners, BankCard and JCB. Some white label cards are also accepted, such as Farmers, AirNZCard and Elders. For more information, visit the Payment Express website. Once you have added a Payment Express Payment Gateway, you can configure its settings on its associated asset screens. The majority of these screens are the same or similar to those for a Standard Page and are described in the Asset Screens manual. In this chapter, we will describe the Details and Display Formatting screens, which are different for a Payment Express Payment Gateway. The Details screen allows you to configure the settings of the Payment Express Payment Gateway. For more information about the Status, Future Status, Thumbnail and Details sections, refer to the Details Screen chapter in the Assets Screens manual. This section allows you to enter your account details, allowing you to accept payments from the payment gateway. In the Client and Password fields, enter your account details, supplied to you by Payment Express. In order to accept credit card payments from the Payment Express Payment Gateway, you will need to obtain an Internet Merchant Account Facility from your bank and apply for a Payment Express Payment Express account at the Payment Express website. Extra Parameters: Specify additional key and value pairs that will be passed to the payment process server. To enable recurring billing, you will need to set EnableAddBillCard to 1. Pass through variables can also be used here using a special keyword, for example . The full transaction response XML is displayed in the order's details screen. It's stored in the attribute of order called transaction_response. If you are using a listing page to list the orders, you can use the ^xpath keyword modifier in the display format to print values from the XML data. For example, to print the DPS generated billing ID for the order use the following keyword: . This section allows you to use the Address Verification Service (AVS) system as added security for credit and debit card transactions made on the Payment Express Payment Gateway. Please note that this system is not available in all countries. In the Standard Policyfield, select the check requirements of the AVS system for a transaction to succeed. The following options are available. No: no AVS check will be made. Attempt AVS Check: an AVS check will be performed if the address information is supplied however this check is not mandatory for a transaction to succeed. The transaction needs to be checked by AVS: all transactions made on the Payment Express Payment Gateway must be checked by the AVS system. If an AVS check cannot be completed, the transaction will fail. If AVS is enabled, address fields must be included on the payment gateway using keyword replacements. For more information, refer to the Display Formatting Screen section in this chapter. Alternatively, pass through variables can be configured to source the address from the user's e-commerce form responses. For more information, refer to the Pass through Variables section in this chapter. This section allows you to use the Card Verification Value (CV2) system as added security for credit and debit card transactions made on the Payment Express Payment Gateway. In the Standard Policyfield, select the check requirements of the CV2 system for a transaction to succeed. The following options are available. No: no CV2 check will be made. Attempt CV2 Check: a CV2 check will be performed if the card verification value is supplied however this check is not mandatory for a transaction to succeed. If CV2 is enabled, the CV2 field should be included on the payment gateway using keyword replacements. For more information,refer to the Display Formatting Screen section in this chapter. This section allows you to source address information for the Address Verification Service (AVS) from the user's e-commerce form responses. For example, a user's response to a Postcode question on an e-commerce form could be passed through to the Payment Express Payment Gateway to provide the postcode for the AVS. The Pass through Variables section of the Details screen is shown in the figure below. Address 3 Variable Name: enter the pass through variable key for the third line of the address. 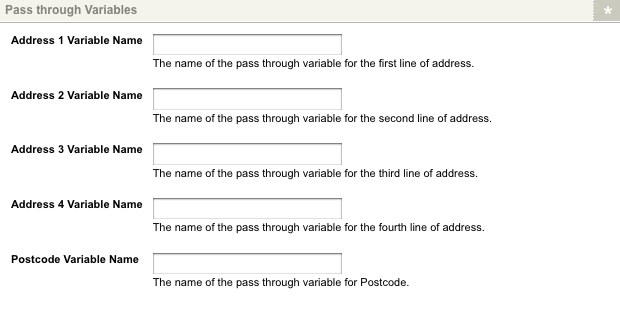 Address 4 Variable Name: enter the pass through variable key for the fourth line of the address. This section allows you to change the button and error text for the payment gateway. The Interface Options section of the Details screen is shown in the figure below. Amount Not Specified Error: enter the text to display when no transaction amount is specified the payment gateway. By default, this error will read No amount is specified for payment. Card Number Not Specified Error: enter the text to display when no card number is provided by the user. By default, this error will read No card number is specified for the payment. Expiry Date Invalid Error: enter the text to display when the user provided expiry date is invalid. By default, this error will read The expiry date (MM/YY) is not valid. Start Date Invalid Error: enter the text to display when the user provided start date is invalid. By default, this error will read The start date (MM/YY) is not valid. Issue Number Invalid Error: enter the text to display when the user provided issue number is invalid. By default, this error will read The issue number is invalid (must be one or two digits long). Card Cv2 Not Specified Error: enter the text to display when no verification value is specified for the card.By default, this error will read No CV2is specified for the card. 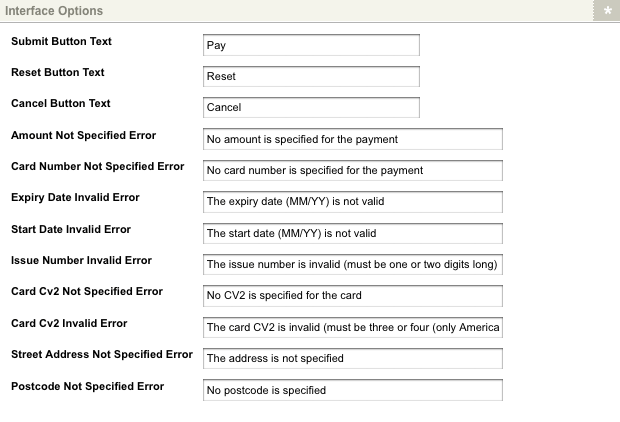 Card Cv2 Invalid Error: enter the text to display when the user provided card verification value is invalid. By default, this error will read The card CV2 is invalid (must be three or four (only American Express Card) digits long). Street Address Not Specified Error: enter the text to display when no street address is specified by the user. By default, this error will read The address is not specified. Postcode Not Specified Error: enter the text to display when no postcode is specified by the user. By default, this error will read No post code is specified. This section allows you to modify the payment gateway to function in Test Mode. TheTesting Mode section of the Details screen is shown in the figure below. In the Test Mode field, select whether or not to use the payment gateway for testing purposes only. If this field is set to On, the payment gateway will not process any payments and the Number field on the Payment Express Payment Gateway form will be replaced with the test drop down menu, as shown in the figure below. The Display Format Bodycopy is used to define the layout of the Payment Express Payment Gateway page. The default layout of the payment gateway is shown in the figure below. 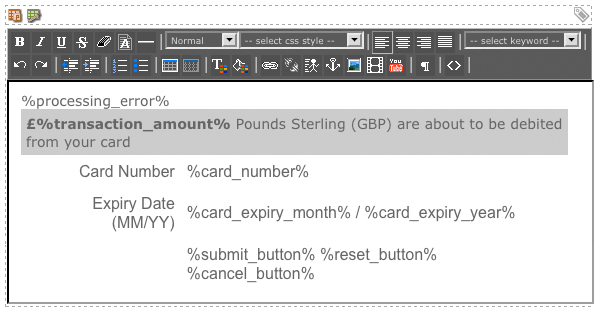 Tip: By default, the transaction amount on the Payment Express Payment Gateway will be listed in British Pounds. This may need to be changed depending on the currency you have selected on the Details screen. Name on Card: this will show the card holder name field. Address Line 1: this will show the first line of street address field. Address Line 2: this will show the second line of street address field. Address Line 3: this will show the third line of street address field. Address Line 4: this will show the fourth line of street address field. Postcode: this will show the postcode field. Tip: A number of these fields are compulsory when creating a working payment gateway. If the required fields are not available to the user,the transaction will not be able to be completed.